There are also a lot of examples of there being more than 1 swing. If Trump fails to live up to the hooge expectations he has set people up with there is a distinct possibility of a massive lurch to the left and a Sanders style democrat being elected in 4 years. Last edited by dahamsta; 31/01/2017 at 11:27 PM. Greece. After the crash the Greek people chucked out the traditional centre-left party and put in the centre-right crowd. Then when they did no better they swung back to the left and went for Syriza. I am extremely hopeful for what Trump will do as President. Ignoring all the noise that is around him - some of which is his own doing, most of which is the incessant wailing from the liberal MSM - he has accomplished more in terms of an agenda in a week than Obama did in 8 years, including 2 when Dems had control of the house and senate. That said, if Trump fails to deliver, i do not see a massive lurch to the left - and for a couple of reasons. I dont think Trump represents a massive lurch to the right. He's essentially independent, he is a populist candidate with some centre right policies and a couple of (what you might consider more traditional) leftist policies. Hes no where near as right wing as, say, the Tea Party cohort of the Republican Party or some of the true right wing politicians in Europe. Also, i think the Democrats are in a lot of trouble. They have abandoned their traditional principles in favour of chasing a slice of the corporate pie. They continue to look outside of their party to find reasons why they lost to Trump instead of being self critical and foraging a new path. They also will lose more votes the more they continue to divide the country along race lines and deligitimize Trump. The bitterness is far more worrying and severe than i thought it would be. Other reasons why i dont see a lurch to a far left candidate is that they have had essentially that for the previous 8 years and nothing that improved the lives of ordinary Americans was achieved. Even Obamacare has failed in many ways. An agenda that furthered globalism, poor trade deals, a foreign policy of interventionism and that ushered wildcat terrorism through the creation of ISIS is what they have to show for the Obama years. I do not think history will look favourably on Obamas tenure at all. Here is an interesting and short interview with Tulsi Gabbard, an up and coming Dem, with CNN last night. FYI she was interviewed by Trump for the SoS position. This is the type of truth that the rest of her party needs to engage in before they can be taken seriously again. How can you fund terrorists that want to destroy you? How can you attend/support marches for womens rights in America when you take money from Saudi Arabia? The hypocricy of the left is astounding in so many ways. The desparation of CNN to find a way to defend (or have Gabbard defend) these actions is funny. She didnt. Sorry to Godwin the thread, but, well, Hitler accomplished a lot too. Although I wouldn't call what Trump is doing "accomplishments". The entire senior State department staff leaving en masse is not an accomplishment; and that's just the latest example. It's true. He's doing what he said he would and what he was voted in to do. Like I said, I have high hopes he'll do well. Yeah good to see him sticking up for the ordinary people and attempting to get rid of the estate tax in Congress today. It's literally the only decent progressive tax they have over there. Last edited by dahamsta; 27/01/2017 at 9:03 PM. Im not saying he's perfect by any means (although show me a US president that was) but this is what I'd be holding him accountable to if I had voted for him. RAM, why are you reading WaPo and trying to get a fair take on Trump - it won't happen. Unrelated image below. Take their points of view with a grain of salt. Last edited by SkStu; 27/01/2017 at 1:14 AM. John Pilger wrote an excellent piece (published four days before Trump's inauguration) on where responsibility rests for Trump's rise, but it echoes some of your sentiments here on the failures and hypocrisy of Obama, the Democrats and the so-called "liberals" of the American (and British) "left". There is something both venal and profoundly stupid about famous writers as they venture outside their cosseted world and embrace an "issue." Across the review section of the Guardian on Dec. 10 was a dreamy picture of Barack Obama looking up to the heavens and the words, "Amazing Grace" and "Farewell the Chief." The sycophancy ran like a polluted babbling brook through page after page. "He was a vulnerable figure in many ways ... But the grace. The all-encompassing grace: in manner and form, in argument and intellect, with humour and cool ... (He) is a blazing tribute to what has been, and what can be again ... He seems ready to keep fighting, and remains a formidable champion to have on our side ... The grace ... the almost surreal levels of grace." One of the persistent strands in U.S. political life is a cultish extremism that approaches fascism. This was given expression and reinforced during the two terms of Barack Obama. "I believe in American exceptionalism with every fiber of my being," said Obama, who expanded the United States' favorite military pastime: bombing and death squads ("special operations") as no other president has done since the Cold War. Every Tuesday — reported the New York Times — he personally selected those who would be murdered by mostly hellfire missiles fired from drones. Weddings, funerals, shepherds were attacked, along with those attempting to collect the body parts festooning the "terrorist target." A leading Republican senator, Lindsey Graham, estimated, approvingly, that Obama's drones killed 4,700 people. "Sometimes you hit innocent people and I hate that," he said, "but we've taken out some very senior members of Al Qaeda." Like the fascism of the 1930s, big lies are delivered with the precision of a metronome, thanks to an omnipresent media whose description now fits that of the Nuremberg prosecutor: "Before each major aggression, with some few exceptions based on expediency, they initiated a press campaign calculated to weaken their victims and to prepare the German people psychologically ... In the propaganda system ... it was the daily press and the radio that were the most important weapons." Take the catastrophe in Libya. In 2011, Obama said Libyan president Muammar Gaddafi was planning "genocide" against his own people. "We knew ... that if we waited one more day, Benghazi, a city the size of Charlotte, could suffer a massacre that would have reverberated across the region and stained the conscience of the world." This was the known lie of Islamist militias facing defeat by Libyan government forces. It became the media story and NATO — led by Obama and Hillary Clinton — launched 9,700 "strike sorties" against Libya, of which more than a third were aimed at civilian targets. Uranium warheads were used; the cities of Misurata and Sirte were carpet-bombed. The Red Cross identified mass graves, and UNICEF reported that "most (of the children killed) were under the age of ten." Under Obama, the U.S. extended secret "special forces" operations to 138 countries, or 70 percent of the world's population. The first African-American president launched what amounted to a full-scale invasion of Africa. Reminiscent of the "Scramble for Africa" in the late 19th century, the U.S. African Command has built a network of supplicants among collaborative African regimes eager for U.S. bribes and armaments. Africom's "soldier to soldier" doctrine embeds U.S. officers at every level of command from general to warrant officer. Only pith helmets are missing. It is as if Africa's proud history of liberation, from Patrice Lumumba to Nelson Mandela, is consigned to oblivion by a new master's Black colonial elite whose "historic mission," warned Frantz Fanon half a century ago, is the promotion of "a capitalism rampant though camouflaged." It was Obama who, in 2011, announced what became known as the "pivot to Asia," in which almost two-thirds of U.S. naval forces would be transferred to the Asia-Pacific area to "confront China," in the words of his defense secretary. There was no threat from China; the entire enterprise was unnecessary. It was an extreme provocation to keep the Pentagon and its demented brass happy. In 2014, the Obama administration oversaw and paid for a fascist-led coup in Ukraine against the democratically-elected government, threatening Russia in the western borderland through which Hitler invaded the Soviet Union, with a loss of 27 million lives. It was Obama who placed missiles in Eastern Europe aimed at Russia, and it was this winner of the Nobel Peace prize who increased spending on nuclear warheads to a level higher than that of any administration since the cold war, having promised, in an emotional speech in Prague to "help rid the world of nuclear weapons." Obama, the constitutional lawyer, prosecuted more whistleblowers than any other president in history, even though the U.S. constitution protects them. He declared Chelsea Manning guilty before the end of a trial that was a travesty. He has refused to pardon Manning who has suffered years of inhumane treatment which the U.N. says amounts to torture. He has pursued an entirely bogus case against Julian Assange. He promised to close the Guantanamo concentration camp and didn't. Following the public relations disaster of George W. Bush, Obama, the smooth operator from Chicago via Harvard, was enlisted to restore what he calls "leadership" throughout the world. The Nobel prize committee's decision was part of this: the kind of cloying reverse racism that beatified the man for no reason other than he was attractive to liberal sensibilities and, of course, U.S. power, if not to the children he kills in impoverished, mostly Muslim countries. William I. Robinson, professor at the University of California, and one of an uncontaminated group of U.S. strategic thinkers who have retained their independence during the years of intellectual dog-whistling since 9/11 wrote this last week, "President Barack Obama ... may have done more than anyone to assure Trump's victory. While Trump's election has triggered a rapid expansion of fascist currents in U.S. civil society, a fascist outcome for the political system is far from inevitable ... But that fight back requires clarity as to how we got to such a dangerous precipice. The seeds of 21st-century fascism were planted, fertilized and watered by the Obama administration and the politically bankrupt liberal elite." Robinson points out that "whether in its 20th or its emerging 21st-century variants, fascism is, above all, a response to a deep structural crisis of capitalism, such as that of the 1930s and the one that began with the financial meltdown in 2008 ... There is a near-straight line here from Obama to Trump ... The liberal elite's refusal to challenge the rapaciousness of transnational capital and its brand of identity politics served to eclipse the language of the working and popular classes ... pushing white workers into an 'identity' of white nationalism and helping the neo-fascists to organize them." The seedbed is Obama's Weimar Republic, a landscape of endemic poverty, militarized police and barbaric prisons, the consequence of a "market" extremism which, under his presidency, prompted the transfer of US$14 trillion in public money to criminal enterprises in Wall Street. 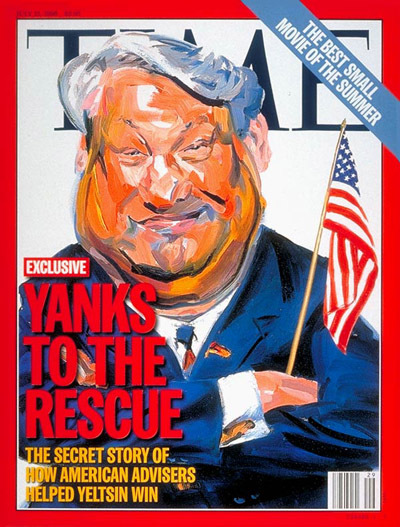 The lies about Russia — in whose elections the U.S. has openly intervened — have made the world's most self-important journalists laughing stocks. In the country with constitutionally the freest press in the world, free journalism now exists only in its honorable exceptions. The obsession with Trump is a cover for many of those calling themselves "left/liberal," as if to claim political decency. They are not "left," neither are they especially "liberal." Much of the United States' aggression towards the rest of humanity has come from so-called liberal democratic administrations such as Obama's. The U.S.' political spectrum extends from the mythical center to the lunar right. The "left" are homeless renegades Martha Gellhorn described as "a rare and wholly admirable fraternity." She excluded those who confuse politics with a fixation on their navels. While they "heal" and "move forward," will the Writers Resist campaigners and other anti-Trumpists reflect upon this? More to the point: when will a genuine movement of opposition arise — angry, eloquent, all-for-one-and-one-for all. Until real politics return to people's lives, the enemy is not Trump, it is ourselves. Last edited by DannyInvincible; 27/01/2017 at 9:35 AM. The video discussion with Greenwald (starting at 45m23s) on alleged Russian hacking in the first of the three links is well worth a watch. This article, instead, is about a report published this week by The Guardian that recklessly attributed to [Julian] Assange comments that he did not make. This article is about how those false claims — fabrications, really — were spread all over the internet by journalists, causing hundreds of thousands of people (if not millions) to consume false news. The purpose of this article is to underscore, yet again, that those who most flamboyantly denounce Fake News, and want Facebook and other tech giants to suppress content in the name of combating it, are often the most aggressive and self-serving perpetrators of it. THE PEOPLE WHO should be most upset by this deceit are exactly the ones who played the leading role in spreading it: namely, those who most vocally claim that Fake News is a serious menace. Nothing will discredit that cause faster or more effectively than the perception that this crusade is really about a selective desire to suppress news that undermines one’s political agenda, masquerading as concern for journalistic accuracy and integrity. Yet, as I’ve repeatedly documented, the very same people most vocal about the need to suppress Fake News are often those most eager to disseminate it when doing so advances their agenda. If one really wants to battle Fake News and deceitful journalism that misleads others, one cannot selectively denounce some Fake News accounts while cheering and spreading those that promote one’s own political agenda or smear those (such as Assange) whom one most hates. Doing that will ensure that nobody takes this cause seriously because its proponents will be seen as dishonest opportunists: much the way cynically exploiting “anti-Semitism” accusations against Israel critics has severely weakened the sting of that accusation when it’s actually warranted. It is well-documented that much Fake News was disseminated this year to undermine Clinton, sometimes from Trump himself. For that reason, a poll jointly released on Tuesday by The Economist and YouGov found that 62 percent of Trump voters — and 25 percent of Clinton voters — believe that “millions of illegal votes were cast in the election,” an extremely dubious allegation made by Trump with no evidence. But this poll also found that 50 percent of Clinton voters now believe an absurd and laughable conspiracy theory: that “Russia tampered with vote tallies to help Trump.” It’s hardly surprising they believe this: Some of the most beloved Democratic pundits routinely use the phrase “Russia hacked the U.S. election” to imply not that it hacked emails but the election itself. And the result is that — just as is true of many Trump voters — many Clinton voters have been deceived into embracing a pleasing and self-affirming though completely baseless conspiracy theory about why their candidate lost. By all means: Let’s confront and defeat the menace of Fake News. But to do so, it’s critical that one not be selective in which type one denounces, and it is particularly important that one not sanction Fake News when it promotes one’s own political objectives. Most important of all is that those who want to lead the cause of denouncing Fake News not convert themselves into its most prolific disseminators whenever the claims of a Fake News account are pleasing or self-affirming. Politicians and those governing have always deceived the public, from before World War 1 to the Iraq War and since. It's not that deception in politics is a new phenomenon; it's more so that the establishment is losing its control or monopoly over the truth, lies and the prevailing or dominant narratives due to social and new media. These "fake news"/"post-truth" tags/smears are weapons utilised by the establishment and the mainstream media to discredit political foes. In many instances, the accusations may indeed be legitimate, but they are so often also indicative of gross double standards. Indeed, the proven unreliability of the mainstream media (which is easier to spot now in the information era of new and social media) only provides fuel for Trump's conspiracy theories and more paranoid utterances. But I think there’s another sort of more pernicious aspect to it, which is what Trump is doing is he’s trying to discredit every single source of information other than Donald Trump. So, he’s telling his followers, "Don’t listen to the American media, because they’re liars." He’s telling them, "Don’t listen to the intelligence community, because they defrauded you with Iraq." He’s telling them, "Don’t listen to experts, because these experts are all corrupted and they’re part of the D.C. swamp," that he wants to drain. "The only truth that you should trust comes from me, Donald Trump." And that is a very dangerous framework. It’s pure authoritarianism when a political leader also becomes the only source of information that the population trusts. But, unfortunately, his biggest allies in that are media outlets who have done the kinds of things that I just explained The Washington Post having done and journalists having helped them. They’re the reason why people are losing faith in American media outlets. And that’s what gives space to a demagogue like Donald Trump to say, "I’m the only person who you can trust." And his use of Twitter is really a weapon, a powerful weapon, in achieving that dangerous state of affairs. Last edited by DannyInvincible; 27/01/2017 at 9:56 AM. You can make “one law for me, another for thee” your credo, but you can’t be too surprised when others are unimpressed. In his recently published research innocuously titled Partisan Electoral Interventions by the Great Powers, Dov Levin of Carnegie Mellon University, counted up more than 80 US interventions in foreign elections between 1946 and 2000. When he added in the USSR/Russia, the total came to 117 electoral interventions, "one out of every nine competitive, national-level executive elections". Mr Levin did not count non-electoral attempts at regime change, such as coups. Instead, he focused on creating a data set of "partisan electoral intervention by the great powers". For this he used primary and secondary sources, including formal US Congressional investigations of CIA activities, declassified internal CIA histories and CIA officers’ and other US officials’ memoirs. For the Soviet/Russian interventions, he primarily consulted the Mitrokhin Archive, notes kept for over 30 years by a KGB archivist who defected to Britain. After poring over the data, Mr Levin was able to arrive at a very definite conclusion. As he says, "the United States is the most common user of this technique". Russia or the Soviet Union used it half as much, while the Chinese and the Venezuelans under the late Hugo Chavez employed it only sometimes. There is little reason for the US to feel aggrieved that it is hoist with its own petard. That said, it may be shortsighted to celebrate America’s predicament. What the US did to others was as wrong as the wrong it alleges has now been done to it. There are dangerous implications for democracies around the world or, at least, for the future of competitive elections. That poster is absolutely hilarious - "The Restoring Community Safety Act" - why doesn't he just go the whole hog and put in the "Orange Skin and blond highlights act" - "The foot.ie" Act. That Poster is a populist list of absolute and utter scutter and lies dreamt up to try and win an election. It has ZERO basis in reality - I mean how stupid do you have to be to absorb all of that. Six measures to clean up the corruption and special interest in Washington – what a laugh – Look at his administration – Betsy De Vos – her family has given OVER $200m to the republican party over the last 25 years! He has a Labour Secretary who is has so many concerns surrounding him – he can’t even get his confirmation hearing organised. The whole thing is a complete joke – let’s look at it again in 93 day’s time. It's a bit ironic that you mention 'a fair take' and in an attempt to show bias, you link to an organisation that is itself openly biased. A lot to read and respond to here. Also my last day in my current job. So ill attempt to respond and react to everyone over the next couple of days. Osa, i linked to the MRC article which, yes, is an organization that takes on the liberal MSM from a conservative position. However, the article itself is just one of many that points out the links between the likes of WaPo et al and the globalist agenda of Soros and co. And the influence that these players have on US politics and how that is supported by a corrupt media. I feel it is important that we are all able to look at our own information sources with as much of a critical eye as we possibly can and challenge our own biases. The image is the one that i would encourage more people to spend time on. These are facts supported by the Podesta leaks. These are all huge organizations that i would say 90% of the populace place a high level of trust in. I spent an unhealthy amount of time last year diving into this stuff and it really is quite shocking the levels of collusion and corruption that are taking place and, more shockingly, that we are simply gobbling up as "the truth". For all that MRC has its agenda, it is not a huge player and it is open and transparent. 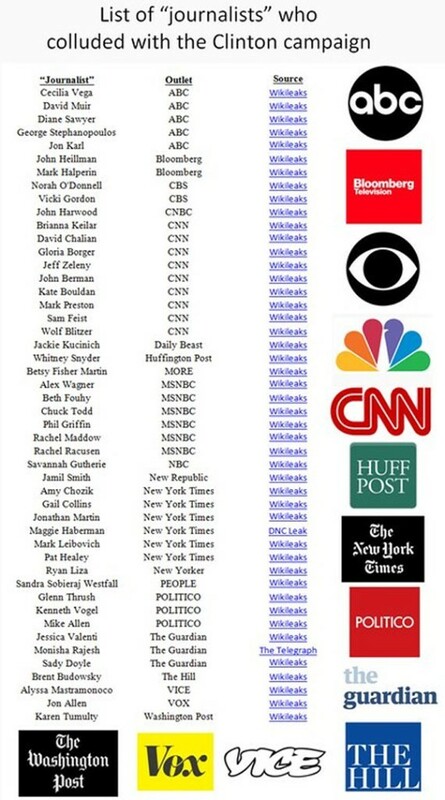 The organizations in the above image are huge players and they are not transparent about their agenda at all and promote themselves as independent media. This is genuinely troubling stuff and this, more than anything Trump has said or will do, is what is creating instability in America and beyond. It was created as part of his transition i.e. after he won. But how and ever. Whether you think this stuff is right or wroing, achievable or pie in the sky, it is his accountability framework and - yes - we should see how he has done in 93 days time, just like i suggested. We will see how he - and his picks - do after his term is done. If someone believes he has failed before he has started then it is that person that is being stupid. It'll be interesting to see how the NAFTA and the WTO react to this 20% import tax plan. I'm guessing negatively. The man and his administration just seem to have a hair-trigger when it comes to policy ideas. Someone on another forum I frequent commented on his idea to send "the feds" to Chicago to stop organized crime: "What feds? What agency? To play what role? It's just something he heard on TV, apparently." The man's Twitter account has already caused a diplomatic incident. I have a feeling Paul Ryan's Congress is just waiting for the right issue to pull the rug out from under Trump - whose favorability ratings are shockingly low for a newly inaugurated President - and establish their authority. Ryan's already taken a shot by suggesting Trump drop his moronic attitude towards his decisive loss in the popular vote, and the media is treating his administration with greater and greater amounts of undeniable contempt every day it seems: Bannon's comments recently just seem bizarrely self-hurting. I will say that as someone who would have no qualms being described as a liberal progressive, its disappointing to see some of the rhetoric being thrown around by that "side" since the election and especially in the last week, that bears an uncomfortable similarity to the kind of rhetoric thrown around in the Obama years by a certain strain right wing, which was so easy to mock. Democracy being described as irredeemably broken, legitimacy being questioned, the other side being painted in apocalyptic terms, open violence being not just endorsed but praised as a means of political expression, etc. Michelle Obama's rallying cry of keeping to the high road seems to have been completely discarded by a generation of angry young left voters suddenly realizing that not everything goes your way. They really need a figurehead to group around at this point, someone akin to Sanders but not quite that left, to start putting front and centre as an alternative. But it doesn't seem like the Democratic party is overflowing with Presidential hopefuls right now. The image is the one that i would encourage more people to spend time on. These are facts supported by the Podesta leaks. These are all huge organizations that i would say 90% of the populace place a high level of trust in. I spent an unhealthy amount of time last year diving into this stuff and it really is quite shocking the levels of collusion and corruption that are taking place and, more shockingly, that we are simply gobbling up as "the truth". For all that MRC has its agenda, it is not a huge player and it is open and transparent. The organizations in the above image are huge players and they are not transparent about their agenda at all and promote themselves as independent media. This is genuinely troubling stuff and this, more than anything Trump has said or will do, is what is creating instability in America and beyond. Am I the only one who didn't see any image attached to that post? Donald Trump is signing a refugee ban on Holocaust Remembrance Day. Bill Clinton speaks out in favour of Trump policy.